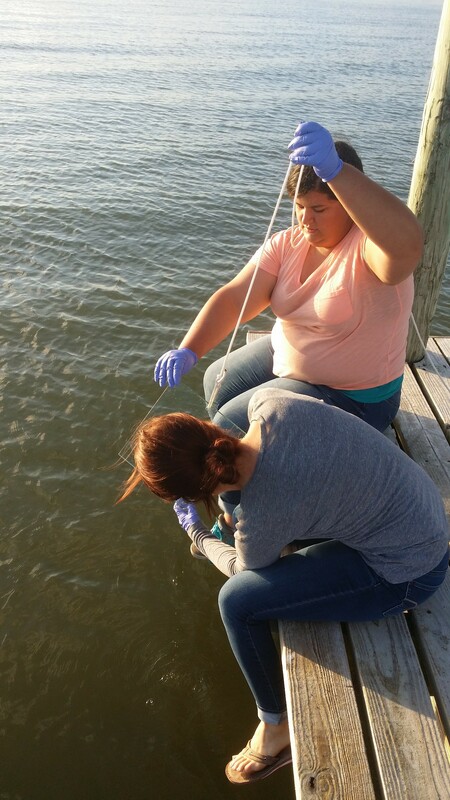 While working both in the research laboratory at the Harte Research Institute, and also on Ocean Dr. doing field work we obtained pertinent information to create a health assessment of the bay of Corpus Christi. 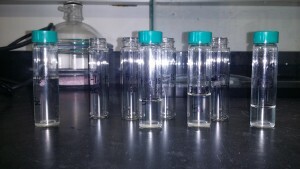 The samples that we obtained while following a strategic and precise process each time allowed for us to gather resource to extract the necessary components while in the lab. We used powder free nitrile gloves, Dichloromethane (DCM), a 40 mL vial with lid, n-alkaline composite standard,separation/sep funnel, graduated cylinder, ring stand, and syringe for the separation process. While separating the components that we needed we followed the procedure outline time and time again (see below) and completed the process under a ventilation hood. Each and every one of the items of glassware that we used was heated before hand (ashed) in order to make sure that it was completely sanitized and no humidity was present. The controlled variables were kept controlled to our best ability throughout the experiment and the dependent variable remained what would come of our results. We practiced sampling of the micro layer and talked about the necessary oceanic conditions before conducting research that would be used for our conclusion. In order to ensure that we completed the process correctly we also conducted a trial run in the field with realistic environmental factors present. We went through appropriate cleaning of materials with ethanol, de-ionized water, and chem wipes a multitude of times. 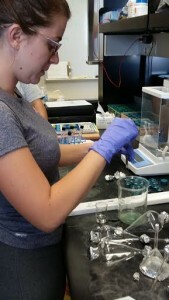 While separating the organic compounds in the lab we used 15 ml total of DCM, and 5 ml of the standard N-Alkaline component. 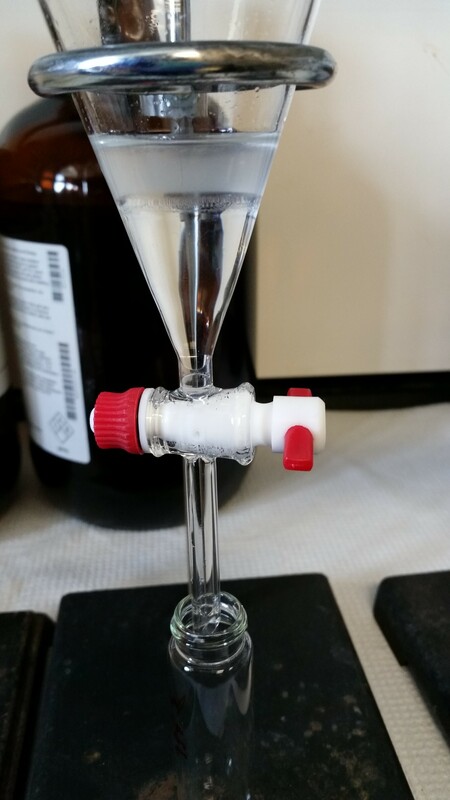 While adding chemicals and creating a mixture it was important to remember to burp the beaker after about 10 turns – stopping at sixty. If we didn’t burp the beaker we were liable to have it shoot off and break (note to self: it is so important to know what you are working with, how powerful it is, and the safety procedures to keep in place.) We refrigerated these samples after extraction to prevent evaporation or tampering. Each and every time that we conducted research in the field we took 6 separate samples and cleaned our equipment between each. During retrieval of the microlayer we used a glass pane, Teflon scraper, and local pier. The water conditions were important – and alike to when you see a glass smooth bay would be perfect for us. We went out every Tuesday and Thursday bright and early to try and catch the best samples. It took a lot of team work and cooperation to complete the process correctly, as you see one person would dip the glass into the microlayer until fully submerged while the other waited patiently to grab the plate and scrape as much of the sample into the tube as possible (the wind did not help and a lot of the microlayer often dried onto the glass). We learned to be quick. 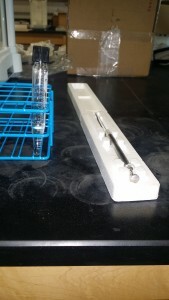 Others would be helping to clean the utensils – ensuring that no microorganisms were pre-exposed to our materials/present to skew the results, and with the various other needs of the research. Human error was controlled as much as possible, but environmental factors played a large role in the experiment. Wind, and oceanic conditions effected greatly how much sample we were able to retrieve. Some days the harvest was as low as 5ml and the better days it was 10 ml. Dr. Silliman will work with our samples to separate the DCM from the microorganisms in our final samples and find the algal N-Alkanes. He will use pure copper beads, silica powder dehumidified, and long test tubes amongst other things. The graphs that he comes up with will be a product of Organic Chemistry and take lots of experience/knowledge to be able to read. The readings of these algal N-Alkanes (long Carbon chains) will provide pertinent information for the health assessment of Corpus Christi Bay. You can learn the same thing by reading as you can by doing. Authentic Science research is different than Science reading. It is important as a future teacher to remember that exploration leads to greater learning and understanding than direct instruction. When first hearing about the experience I was sure of what I thought it was going to be like, but boy was I wrong. Environmental factors, new equipment introduced, specific measurements and tools for chemicals used, and even the lab was different than anything I had ever experienced. It is important to step into the shoes of a scientist and become thoroughly engaged to understand what they do down to the nitty gritty. The machinery used and how largely the simplest of tasks can effect the results is so important. 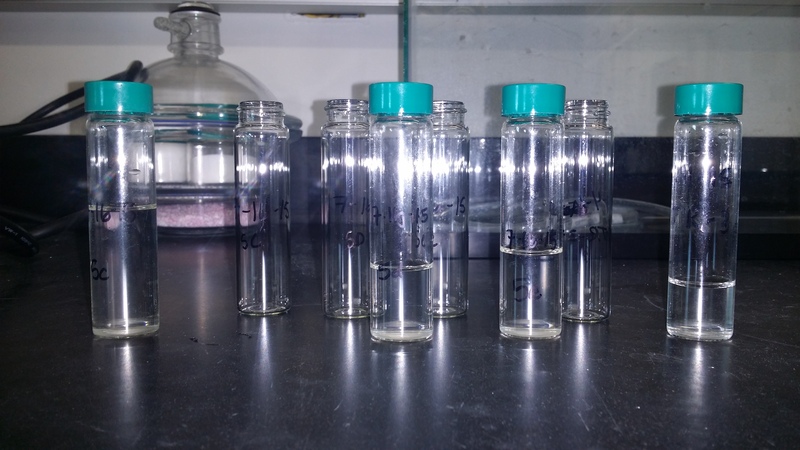 Each ml of sample was of utmost importance, and the precise cleaning procedures had to be conducted or the results were null (try labeling a tube from the field wrong and having to throw away the entire thing – it is no fun). I learned that Science is all about every single step, and most importantly about the inquiry. Elaborate on what you know, and expand your horizons on what you may not. 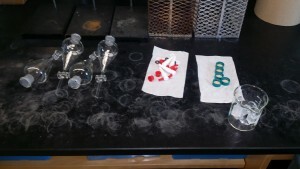 While we researched and conducted the steps in our set out plan we had to modify how much chemical we used and the tools that we used along the way to provide the best results just like we will have to do in the classroom. Being a scientist is about exploration and this process truly taught me that scientific exploration is more than being in a lab and following steps. Most importantly it’s about asking tons of questions, being precise, and trying multiple different ideas. Science is about being an engaged explorer. How would our research be different after a hurricane took place in the Gulf of Mexico? How does Corpus Christi’s current unhealthy tap water compare to the samples we have collected? How does our research compare to a nearby coastal city such as Rockport? How does our research compare to a location not near in proximity such as Lake Michigan? What will our research prove about the health assessment of Corpus Christi Bay? 1) Science, as defined by the National Academy of Science, is the “use of evidence to construct testable explanations and predictions of natural phenomena, as well as the knowledge generated through this process.” This vast body of changing and increasing knowledge is described by physical, mathematical, and conceptual models. Students should know that some questions are outside the realm of science because they deal with phenomena that are not scientifically testable. (2) Scientific hypotheses are tentative and testable statements that must be capable of being supported or not supported by observational evidence. Hypotheses of durable explanatory power that have been tested over a wide variety of conditions become theories. Scientific theories are based on natural and physical phenomena and are capable of being tested by multiple, independent researchers. Students should know that scientific theories, unlike hypotheses, are well-established and highly reliable, but they may still be subject to change as new information and technologies are developed. Students should be able to distinguish between scientific decision-making methods and ethical/social decisions that involve the application of scientific information. (3) Grade 6 science is interdisciplinary in nature; however, much of the content focus is on physical science. National standards in science are organized as multi-grade blocks such as Grades 5-8 rather than individual grade levels. In order to follow the grade level format used in Texas, the various national standards are found among Grades 6, 7, and 8. Recurring themes are pervasive in sciences, mathematics, and technology. These ideas transcend disciplinary boundaries and include change and constancy, patterns, cycles, systems, models, and scale. (A) Scientific investigations and reasoning. (i) To develop a rich knowledge of science and the natural world, students must become familiar with different modes of scientific inquiry, rules of evidence, ways of formulating questions, ways of proposing explanations, and the diverse ways scientists study the natural world and propose explanations based on evidence derived from their work. (ii) Scientific investigations are conducted for different reasons. All investigations require a research question, careful observations, data gathering, and analysis of the data to identify the patterns that will explain the findings. Descriptive investigations are used to explore new phenomena such as conducting surveys of organisms or measuring the abiotic components in a given habitat. Descriptive statistics include frequency, range, mean, median, and mode. A hypothesis is not required in a descriptive investigation. On the other hand, when conditions can be controlled in order to focus on a single variable, experimental research design is used to determine causation. Students should experience both types of investigations and understand that different scientific research questions require different research designs. (iii) Scientific investigations are used to learn about the natural world. Students should understand that certain types of questions can be answered by investigations, and the methods, models, and conclusions built from these investigations change as new observations are made. Models of objects and events are tools for understanding the natural world and can show how systems work. Models have limitations and based on new discoveries are constantly being modified to more closely reflect the natural world. The TEKS strongly reflect throughout the middle grades a connection to exploring the natural world. The field experiments that we did were done after creating a hypothesis, reflecting on our previous schema of conditions and environmental factors, creating a procedure list that demonstrated how we would conduct our research, and what exactly we were looking to find. We gathered data, and carefully observed just as I will teach the future learners in my classroom to do. After conducting our research each and every day I reflected in my ETEAMS binder on everything that we had done that day. This is important to be descriptive and understand research design as discussed in the 6th grade science TEKS above. Reflection for both myself – and my future learners helps the academic takeaway. Although we cannot conduct the very same research experiment in our classrooms, we can teach our students authentic science and that science is all around us ready to be freely explored and uncovered. I feel like a way to relate this project/research experience to my future classroom would be to talk about the health of our coastal ecosystems, our surrounding environments, do research on algal plants that the students can find, assess what the students already know about our coastal environment and expand their knowledge base, have them keep a research notebook, and really just immerse the students in authentic science practices. Teach our students to be and think like scientists.